We often go to Alderley Edge for a leisurely wander through the woods. There are myriad tracks and trails along this sandstone escarpment which overlooks Manchester and the “Millionaire Belt” of East Cheshire and there is always a wonderful cake to be had at the Wizard Tearoom. I won’t go into the details of the Wizard’s tale here, suffice to say that it is tangled up with Aurthurian legend and The Sleeper’s Hall where Arthur’s Knights wait on England’s call. It’s the subject of more than a few local folksongs and was probably the main stimulus behind Alan Garner’s “The Weirdstone of Brisingamen “. 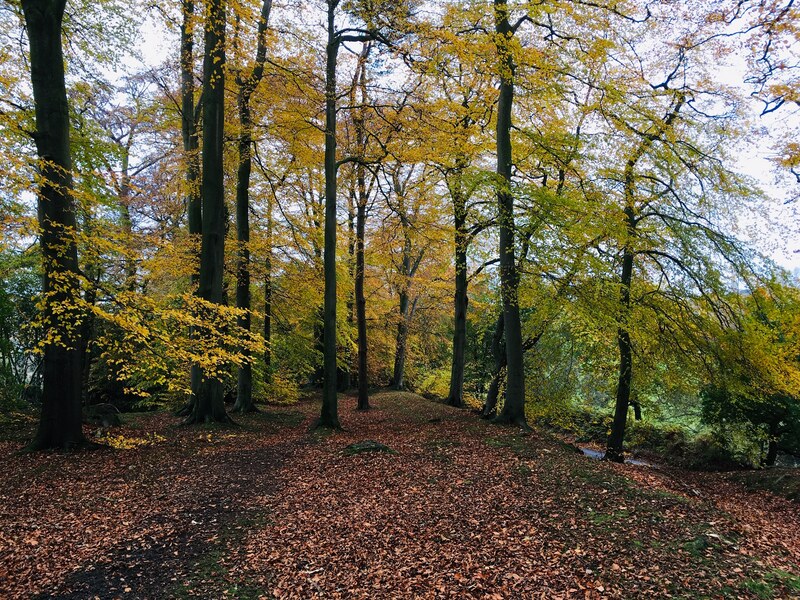 Whatever, we had just gone to wander through drifts of dead leaves beneath the gold and russet canopy of beech, oak & chestnut and the sycamore, with their huge lemon-tinted leaves blotched with great blobs of black fungal growth. Now, although we walk here several times a year and think we know our way about, somehow we always end up in a place we didn’t expect to arrive at. I don’t know why this should be. We don’t get lost anywhere else – ever! I have a theory that the Wizard has something to do with it.